If you’re buying a home, or have purchased one in the past, you may have wondered why exactly you should be getting title insurance. The truth is, title insurance is an important part of purchasing a home. While you may fall in love with the spacious kitchen or the location of a new home, what you don’t see can end up hurting you. After all, there’s a good chance that you aren’t knowledgeable of the property’s history. A proper title search can help reveal title-related defects related to your property. And, depending on the terms of the title insurance policy, you may be provided with coverage from title problems that are found after the transaction is already closed. The owners of your property prior to you may have been totally responsible when it comes to paying bills and bookkeeping. Even though it is not yours, former debts from the previous owners can be transferred to the current property owner (you). Financing companies, like banks, have the power to place liens on your property due to unpaid debts, which can happen even after the transaction is already closed. Basically, if an unrecorded lien is placed on your property — once the sale becomes final — the debt now belongs to you. This can cause stress and worry, especially if you’re dealing with a distressed property. In a perfect world, everyone would be honest. Unfortunately, we are not yet there. Although unethical, sometimes forged documents that influence property ownership are filed in public records, covering up the rightful ownership of the home or property. Forgeries can stay hidden for a while, but once they come to light, the rights to your home may be at risk. As humans, we make plenty of mistakes. But when those mistakes affect your home or property, the result can be devastating. Even the smallest filing or clerical errors could affect the survey or deed. These errors require financial strain in order to resolve them. Oftentimes when a property owner passes on, the state may choose to sell his or her belongings and assets, including the home or property. Once the transactions are final and closed, you would think you have full ownership of the home, right? Wrong. In the event that a will from the previously deceased owner is discovered, your ownership rights to the property may be in serious jeopardy. Easements can affect your ability to enjoy your property and may limit your freedom to what can do to your own land. When you purchase the property, you may be unaware that an easement, like a government agency, business, or other entity, holds a claim to all or a portion of your property. These third parties may have to access your property from time to time and may even restrict you from building or developing the property. Even though the chain of title on your home or property may seem normal, there is a possibility that a prior deed was created by an undocumented immigrant, a minor, a person who is not qualified to execute a previous deed, or a married person who reported themselves as single. All of these possibilities can impact the enforceability of the previous deed, which can affect the present and prior ownership. If a neighbor, government agency, or another entity claims ownership to a part of your property, you may have some stress-filled days ahead of you. There could potentially be surveys that show differing boundaries and property lines. If these surveys are brought into the light, another party may be able to claim ownership to a small or large portion of your property. If a property owner passes and the property is sold, it is essential to figure out if there are any heirs. Usually, once the property owner passes, the home or property will fall to their heirs or others specified in their will. It is common for those heirs to not be present at the time of death. In addition, sometimes family members of the deceased owner may contest the will for their own rights to the property. Even though these scenarios generally happen long after you completed the purchase of the property, your property rights could be in danger. When you purchase a home, you may not be aware that a third party owns a claim to all or a portion of your property. This can be due to a former lien or mortgage, or by restrictions, covenants limiting the use of your property, and other non-financial claims. As you can see there are many ways that your property rights could easily be jeopardized. 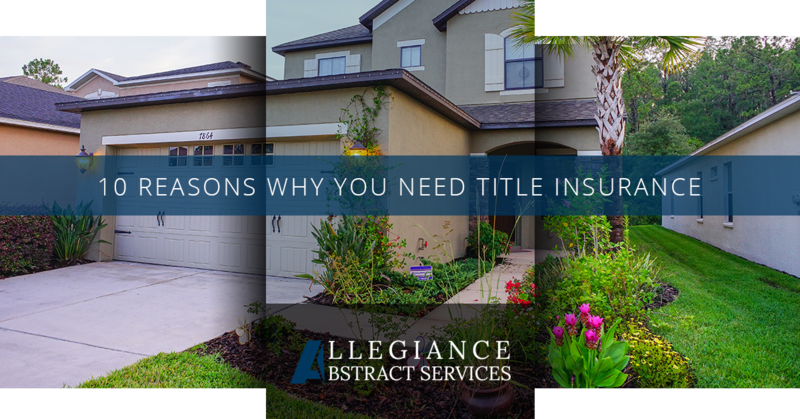 These common title issues, as well as many others, are often covered by an owner’s policy of title insurance. When you buy a home or property, it is important to ensure you’re protecting your investment by getting title insurance. 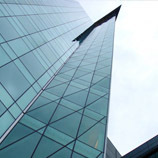 At Allegiance Abstract Services, we can provide a full range of title insurance products. 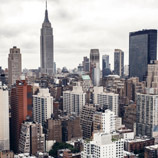 We’ll handle the entire process, contact Allegiance Abstract Services for New York title insurance.